SBW Romero Vitro is tissue culture laboratory and presents large-scale production center of seedingsfor SBW International BV from Roelofarendsveen, netherlands. It is located in Vinica, a small town at river Bregalnica valley in the eastern part of Macedonia. 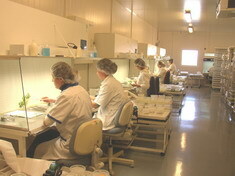 Production started in August 2001, after training Macedonian employees at the home company in The Netherlands. All production is planned by the department of Planning and Logistics at Roelofarendsveen. The starting materialfor the production is also received from the home company. All products are exported back to The netherlands, from where the plants are distributed to our clients. 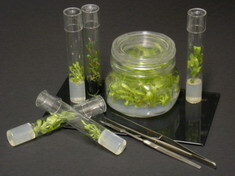 SBW Romero Vitro has a permanent growth as a company. Now the company has fifteen large culture rooms and three transfer rooms. This provides the company with the capacity to produce more than nine million plants annually. Whole capacity at this moment is executed with 125 employees who contribute to the permanent growth and development of the company.